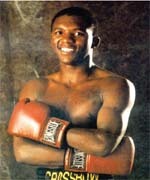 Dingaan Bongani “The Rose of Soweto” Thobela was born at Baragwanath hospital on 24 September 1966. His mother named him Bongani, but his paternal grandmother decided he should have a different name since he had a half brother from his father’s side with the same name. She decided on the name Dingaan. Thobela later decided to keep Bongani as his middle name. His parents separated soon after he was born.